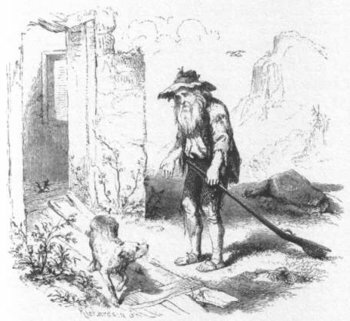 "Rip Van Winkle" is an 1819 short story by Washington Irving. Trope Namer for Rip Van Winkle. This story was published in the collection The Sketch-book of Geoffrey Crayon, Gent., along with another story that became very famous, "The Legend of Sleepy Hollow''. Irving became one of the most famous writers of early American literature. The story has been adapted many times for stage and screen, dating back to a 19th century play and one of the oldest narrative films ever made, an 1896 film of that play. The Popeye The Sailor cartoon Popeye Meets Rip Van Winkle is a loose adaptation of the story, where Popeye tries to help out Rip, who is a sleepwalker in addition to being impossible to awake. Will Vinton made a Stop Motion adaptation in 1978. Awful Wedded Life: When Rip comes back after his nap he is pleased to finds out that his wife burst a blood vessel and died while screaming at a traveling salesman. He whiles away his senior years living happily with his daughter and her husband. Bittersweet Ending: His bitter, shrewish old wife has died, but Rip is shaken to know that a number of his old neighbors have joined to fight in The American Revolution, with one of them killed in action, another joining the Army and another serving in Congress, and that the village switched allegiances from Britain's King George III to George Washington and the U.S.A.
Creepy Crows: The first time Rip hears the cry "Rip van Winkle!" all he sees is a solitary crow flying over the mountain. The Cobbler's Children Have No Shoes: While Rip is very helpful around town and gladly aids people with their daily work, he has an almost pathological aversion to doing work on his own farm or doing profitable labor to provide for his own family. He also befriends neighborhood children, but doesn't really look after his own kids so they always look ragged, wild street urchins. Direct Line to the Author: Comes with an introduction in which the author claims to have found the story among the papers of one "Diedrich Knickerbocker", who supposedly did historical research of the Dutch people living in the Catskills. Don't Go Into the Woods: Rip's walk into the woods leads him to some supernatural beings who wind up getting him into a 20-year nap. The Future Is Shocking: Rip wanders back into town to find everything changed. Many of the buildings are different, he doesn't recognize anyone, his own home is an abandoned ruin, and most shockingly, his Local Hangout inn has been replaced by a large hotel that flies an odd stars-and-stripes flag out front. Generation Xerox/Like Father, Like Son: Rip Jr. is just as lazy as his father. Whoever has made a voyage up the Hudson must remember the Kaatskill mountains... Every change of season, every change of weather, indeed, every hour of the day, produces some change in the magical hues and shapes of these mountains, and they are regarded by all the good wives, far and near, as perfect barometers. When the weather is fair and settled, they are clothed in blue and purple, and print their bold outlines on the clear evening sky, but, sometimes, when the rest of the landscape is cloudless, they will gather a hood of gray vapors about their summits, which, in the last rays of the setting sun, will glow and light up like a crown of glory. Heavy Sleeper: 20 years is a long nap. Henpecked Husband: The Trope Namer. Rip is actually described as "an obedient hen-pecked husband." The story suggests that having a nagging shrew for a wife is what makes him so meek and gentle and so popular with everyone else. The narrator does point out that Rip's wife has cause for being bitchy, namely, that Rip is too lazy to work (on his own place, but he has no problems helping out the neighbors) and that his little farm is going to ruin because he is too lazy/incompetent to do anything with it. Rip takes his fateful walk into the woods in order to get away from his nagging wife. Heroes Love Dogs: Before his enchanted sleep, Rip was never seen without his Canine Companion, Wolf. Jerkass Has a Point: Dame Van Winkle may be a temperamental shrew, but she makes a point that Rip shouldn't expect to "starve by a penny [rather] than work for a pound" when he has a wife and kids who depend on him, and that the town encourages him to neglect his own family when they encourage him to hang out with them rather than come home to her. Local Hangout: Sometimes when Rip wants to get away from his wife he strolls down to the local inn and hangs out with his buddies. He is startled when he comes back to the inn to find that the picture of King George III has been replaced by a picture of one George Washington. Manchild: Rip is a friend to all the children of the village. He makes toys for the kids, plays games and shoots marbles with them, and runs around town with village children riding piggyback. No Name Given: Rip's nagging wife is referred to only as "Dame Van Winkle." One Steve Limit: Averted when Rip asks "Does nobody here know Rip Van Winkle?" A villager replies "Oh yes to be sure, that's Rip Van Winkle over there leaning against the tree," and it turns out to be his son, Rip Van Winkle Jr., who looks just like his father did 20 years ago. Our Ghosts Are Different: Turns out that the strange spirit in old Dutch clothes who met Hudson, and all the other strange, silent men playing ninepins up in the mountains, are the spirits of "Hendrick Hudson" (Henry Hudson ) and his crew. Henry Hudson was an explorer and one of the first Europeans to see the river and the bay named after him, but his crew mutinied and abandoned Hudson and the sailors loyal to him in Hudson Bay in 1611. Hudson and his party were never seen again. According to the story, once every twenty years the ghosts of Hudson and his men get to have a game of ninepins. Parental Neglect: Even before his 20-year-long nap, Rip never helped his wife look after their kids. His children, too, were as ragged and wild as if they belonged to nobody. Rip Van Winkle: Trope Namer, duh. A drunk Rip dozes off in the woods and awakens to find out that 20 years have passed. Although this story is the trope namer, the trope is Older Than Feudalism, dating back at least as far as ancient Rome. Stock Foreign Name: Being a town of Dutch settlers, most of the names are understandably Dutch. Apart from of course the Van Winkles, 'van' is also used for Van Bummel, Van Schaick and Vanderdonk. And then there's "Brom Dutcher". Time Skip: 20 years, long enough to grow a foot-long beard. What Happened to the Mouse? : No mention is made of what happened to Rip's dog Wolf, who had disappeared or probably died of old age.